“View from the Ivory Tower II"
Pencil, pigment, acrylic paint and varnish on panel, approximately 5" x 7"
Here is the first in the series, this one being the view from the balcony of my apartment on the fifth floor of a building that had a park beside it. Pencil, pen & ink, wax crayon, watercolour, varnish and powdered pigment on 100% rag, approx. 8" x 10"
​This picture is now in a private collection. This picture was made after a pause, and then the beginning of some other works in this series that are still in progress. Materials include coloured pencil, wax crayon and watercolour on 100% rag, approx. 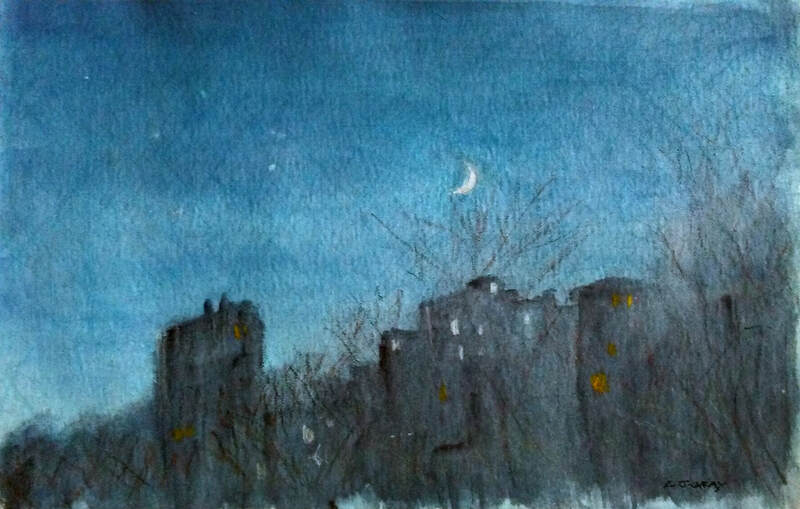 8" x 10"
Here is another night-time scene from the same vantage point, also looking west. Mainly executed with wax crayon and watercolour on 100% rag, approx. 11" x 7"
A pair of crows flew by as this drawing was under way. It was executed in pencil, pen & ink, wax crayon, watercolour, acrylic varnish and powdered pigment on 100% rag, approx. 7" x 6"
Here is another drawing made in that autumn, and on this occasion a family of red-tailed hawks paid a visit at just the right moment, as they so often did. Pencil, pen & ink, wax crayon and watercolour on 100% rag, approx. 5" x 7"